Tomorrow, 22 January, 2019 at 01:00 PM in Strasbourg UHHRU will took part in side event during the Winter Session of PACE. 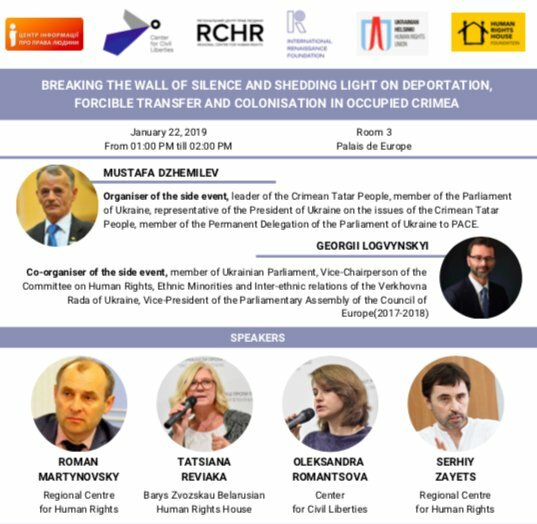 The name of this side event “Breaking the wall of silence and shedding the light on deportation, forcible transfer and colonisation in occupied Crimea”. Last autumn 3 Human Rights Houses undertook a mission aimed at documenting first-hand the human rights situation in occupied Crimea. This was the rare opportunity for an international human rights mission to collect on-the-ground information in what has become a “grey zone” for human rights, subjected ti the rule of the Russian Federation and practically inaccessible to independent international scrutiny. One of the main worrying trends stems from the intention by the Russian Federation to “clear out” the territory of Crimea as fast as possible in order to bring in its own loyal population. The Russian authorities are forcing out of the peninsula the disloyal parts of the population, primarily Ukrainians and Crimean Tatars, turning them into into IDPs in mainland Ukraine. In addition, they are targeting detained Ukrainian citizens, and in particular political prisoners, by illegally transferring them to Russia. During the discussion speakers will present the report of the mission and convey key recommendations to the Council of Europe on how to support human rights in occupied Crimea and how to counter the current process of “colonisation”. Simultaneous translation from Russian to English will be provided.